200 Trapped In Abandoned South African Gold Mine : The Two-Way Rescuers are trying to reach the people, who were discovered after screams were heard coming from a mine near Johannesburg. Illegal mining is common in the region. Rescue services and emergency personal try to free miners trapped underground in Benoni, east of Johannesburg, South Africa, on Sunday. More than 200 illegal miners near Johannesburg, South Africa, are reportedly trapped underground in an abandoned gold mine with rescuers working frantically to save them. 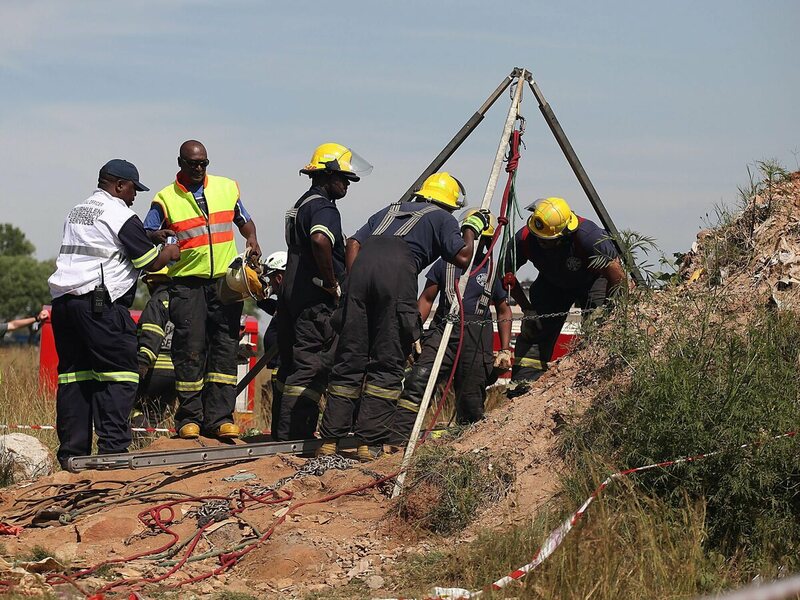 "Approximately 30 people are trapped towards the top of the old shaft and the rest down a steep tunnel," emergency services spokesman Werner Vermaak tells the South African Press Service. Vermaak said the miners were discovered when someone heard screaming Sunday coming from the abandoned mine shaft. Heavy equipment has been brought in to try to clear boulders obstructing the shaft, he said. "It's an abandoned mine shaft in the middle of the public veld (open fields) ... it was not a blocked-off area," Vermaak said. "Illegal mining of abandoned shafts is common in South Africa, where informal miners excavate mineral ore to be sold to buyers, often living underground in dangerous and precarious conditions. Fatal accidents are common, and underground battles between rival groups have also been reported. "The illegal diggers also sometimes invade active mines. At least 82 men — thought to have been illegal miners — died after an underground fire at a Harmony gold mine in South Africa in 2009." Reuters reports that four miners of the 30 or so in the upper part of the mine have been rescued. Vermaak told Reuters they were being medically checked and then handed over to the police.